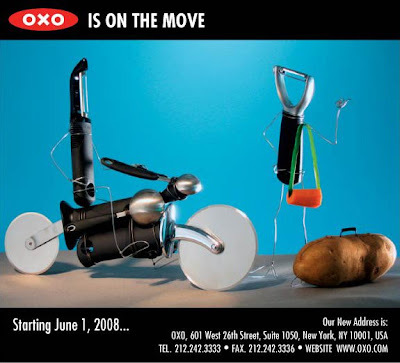 I was happy to make this image for OXO. They needed an image to send out as a change of address announcement. We already had several pieces of theirs in our utensil drawer, so I knew they made a quality product. OXO isn't paying me to put this on my blog, I just thought Bent Objects visitors might want to see it. I made this out of two peelers, two pizza cutters, a set of measuring spoons, and one corn cob holder (plus annealed and galvanized wire). edit- Here's an image where I show the what's what- Details.